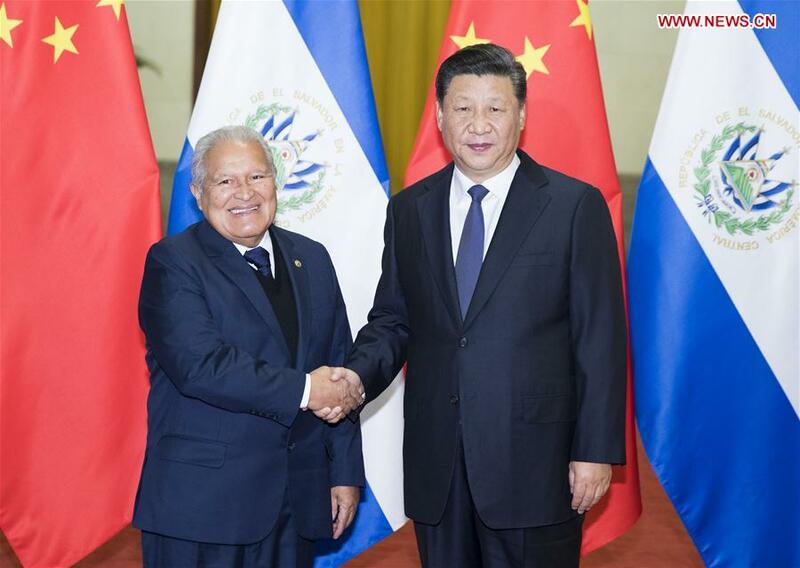 BEIJING, Nov. 1 (Xinhua) -- President Xi Jinping held talks with El Salvador's President Salvador Sanchez Ceren in Beijing Thursday, urging the two sides to consolidate a basis for mutually-beneficial cooperation. Xi welcomed Sanchez's visit to China and his attendance at the first China International Import Expo to be held in Shanghai next week. China and El Salvador established diplomatic ties on Aug. 21 this year. Xi said the two countries have opened up a new chapter of relations ever since. The Chinese people highly appreciate Sanchez, who has significantly contributed to the bilateral ties by making a right and historic decision with strategic vision, political courage and a sense of responsibility, Xi said. "The decision to establish and develop diplomatic ties with each other was independently made by the two sovereign states," Xi said. "It is consistent with the international laws and purposes of the UN Charter and reflects such principles as mutual respect, equal treatment, mutual benefits and common development." "Within slightly more than two months after China and El Salvador forged diplomatic ties, bilateral exchanges have progressed rapidly in various fields with strong vitality and robust momentum," Xi said, adding that this convincingly demonstrates the decision follows the trend of history and is in the fundamental and long-term interests of the two countries. "China is willing to join hands with El Salvador to promote friendly cooperation in a speedy yet steady manner, so as to benefit the two peoples," the Chinese president said. The two countries are faced with key tasks of mapping out cooperation direction as their diplomatic ties are still at an early stage, Xi said, urging both sides to firmly adhere to the one-China principle, which serves as a foundation in bilateral ties. Stressing the importance of mutual understanding and trust, he called for more governance experience sharing, cooperation in local areas and exchanges between the two countries' political parties, legislative bodies and social organizations. "The two sides should boost pragmatic cooperation in various areas, improve cooperative mechanisms, take the joint construction of the Belt and Road as guidance and transform complementary advantages into cooperation results in all aspects," Xi noted. Saying China welcomes El Salvador to expand its export, Xi promised China will take measures to ease El Salvador products' access into the Chinese market. "The Chinese side will cooperate with El Salvador in infrastructure in a government-guided, enterprise-led, market-based and mutually-beneficial way," he stressed, adding that capable Chinese enterprises are encouraged to invest in El Salvador and get more involved in its local society, premised upon legal, compliant and honest operation. "People-to-people exchanges will be made a priority in the hope of benefiting both sides," Xi said. He said China will support El Salvador in education, medical care, water supply and disaster prevention, increase scholarship quotas to El Salvador students, intensify bilateral cooperation in human resources training and list El Salvador as a destination for Chinese group tourists. The Chinese president also called on the two countries to enhance coordination in international and regional affairs, jointly safeguard multilateralism and further advance China's ties with Latin American and Caribbean countries. For his part, Sanchez said establishing diplomatic ties with China is a "long-cherished hope" of El Salvador. He promised El Salvador acknowledges and firmly adheres to the one-China principle. "The two countries have identical positions on many issues, and the development of bilateral relations is based on mutual respect and trust," Sanchez said. "My visit has fully demonstrated El Salvador's confidence in advancing ties with China," he added. Hailing China's remarkable achievements since reform and opening-up, Sanchez said El Salvador also strives to improve economic and social development and people's living standards. "China is our partner in the path of development," Sanchez emphasized. Viewing the upcoming China International Import Expo as "a good platform to introduce El Salvador products," Sanchez said his country welcomes Chinese investment and is willing to strengthen cooperation in areas including trade, agriculture, infrastructure, tourism, medical care, education, finance, science and technology. He also voiced El Salvador's interest in participating in the construction of the Belt and Road. Sanchez thanked China for its timely food aid after the drought in El Salvador not long ago. El Salvador appreciates China's commitment to the building of a community with a shared future for humanity and stands ready to enhance political dialogue with China, and push for cooperation within such multilateral frameworks as the UN and the China-CELAC (Community of Latin American and Caribbean States) Forum, Sanchez said. The two heads of state witnessed the signing of a series of documents on cooperation after the talks. Prior to the talks, Xi held a red-carpet ceremony to welcome Sanchez.